The V40 Deluxe is the first amp in their new Victory heritage series and sees the popular V40 head evolve into a mid-sized combo amp. V40 Deluxe is a 2 x 6L6-powered all-valve amp for classic American cleans through to ’60s British drive, all from one versatile channel. It also has tube driven Tremolo and Reverb with tone and level controls so that you can set how dark or bright your spring reverb sound is. With the widebody cab and Celestion G12H-75 speaker you can expect a fat and full-bodied clean sound from this amp providing the perfect platform to run all of your pedals. With a low and high power mode so you can take the amp from lounge to studio to stage without any troubles. V40 Deluxe is a 2 x 6L6-powered all-valve amp for classic American cleans through to ’60s British drive, all from one versatile channel. It has high- and low-power modes, a hardbypassable series effects loop, plus footswitchable valve-driven tremolo and spring reverb. The reverb has controls for level and tone, enabling you to have a relatively darker or brighter tone to the reverb. 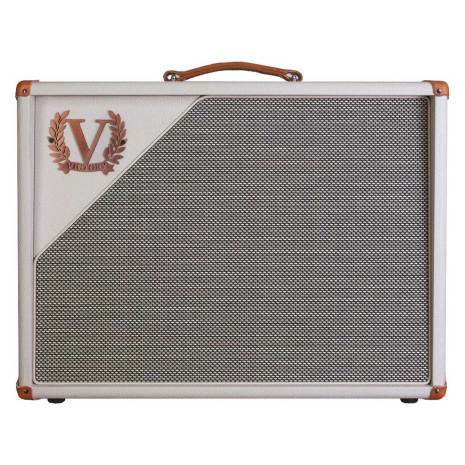 V40 Deluxe comes in two formats: a 1 x 12 widebody combo with Celestion G12H-75 Creamback speaker, and also a head in a traditional wooden sleeve. The V40 Deluxe is part of the Victory Heritage Series. Size(mm): Combo: 598(w) x 453(h) x 250(d).